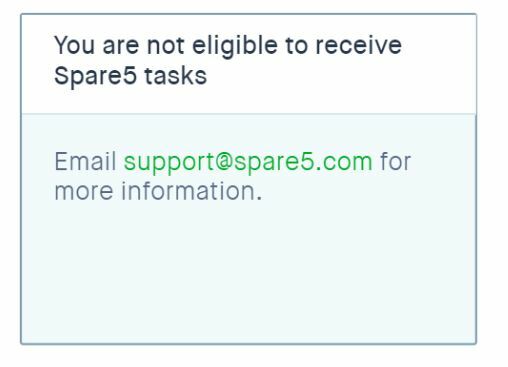 If your tasklist reads "You Are Not Eligible to Receive Spare5 Tasks," you are blocked from receiving Spare5 tasks. Your account may be temporarily suspended because of tasking issues. This decision is based on internal and community reviews of your last group of task sets. If your account is suspended for tasking quality, we'll tell you soon how you can receive more tasks. You will see some new training and tutorial tasks on your tasklist, along with suggestions on submitting and advice. We may also block your account due to the submission of false account information, tasks where an honest effort was not made, or other violations. This decision may be permanent. Please write to support@spare5.com for more details.